I’m not going anywhere for the next couple of days. Because I have the complete run of The Monkees—32 episodes of season 1, and 26 episodes of season 2—spread across two retro-shiny DVD box sets. The Monkees hasn’t been available on DVD for a good decade, and it’s not around in reruns anymore. I am thrilled to revisit this childhood pleasure. Now, I’m too young to have experienced The Monkees and Monkeemania in its original, 1966-68 incarnation. Instead I’m nostalgizing something that was, in and of itself, nostalgia: the mid-‘80s inexplicable Monkees comeback. I watched reruns of The Monkees on MTV and on the local station after school. A tie-in Monkees greatest hits cassette from that era was the first or second album I ever bought with my own money. I’m happy to report that the episodes hold up from the ‘80s to today. This show was so fearlessly brazen in how silly it was that it went all the way around the other side to wind up as cool. I’m sure it ages from the ‘60s to the present as well. Not a lot of ‘60s television has aged well. The episode of My Three Sons I watched today, which was filmed in 1966, the first season of The Monkees, feels like it was written by cats and sent it from outer space. It’s bizarre how foreign and fake it seems. And yet The Monkees, a show that was conceived in cynicism in order to bait young viewers and imitate A Hard Day’s Night with an American (pre)fab four, that’s the one that’s full of joy, not to mention excellent pop music and some extremely groundbreaking techniques. The Monkees still works because we recognize its tropes—it was the blueprint for music videos, because the flying-by-the-seat-of-their-pants creators worked in loose, chaotic, fun film language that became the visual equivalent of rock n’ roll. MTV, and all hip, quick-cut, youth-oriented entertainment that followed, happened and continue to happen because of The Monkees. The Monkees is split into two DVD box sets, released in late September by Eagle Rock Entertainment. So many goodies and bonus materials here. Both sets have commentary from various and assorted Monkees and episode directors (even frequent Monkees-revisiting holdout Nesmith shows up), as well as trivia pages specific to each episode, which is fun and nerdy. Oh, and then there’s the stuff to work the Monkees completists up into a tizzy. 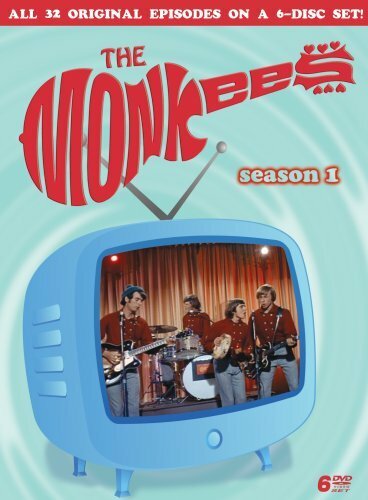 The season 1 box has the long, lost, and fascinatingly awkward, very rough pilot episode (with vocals on the songs laid down sung by their songwriters, Tommy Boyce and Bobby Hart) and some cereal commercials the Monkees starred in. 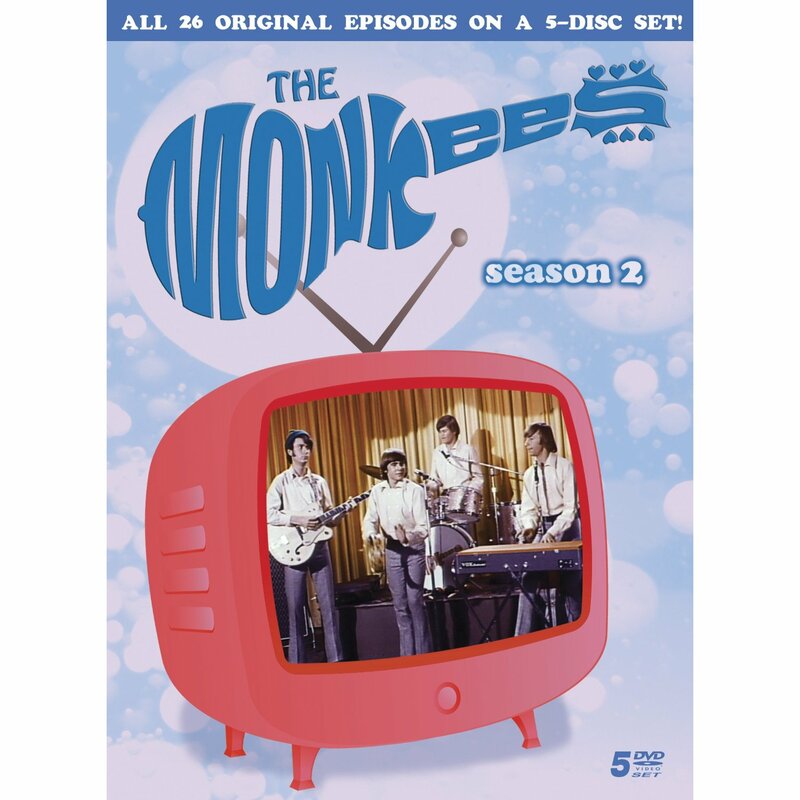 The second season set includes 33 1/3 Revolutions Per Monkee, a bizarre, satiric, and highly experimental TV special the band shot in 1969, well after the series had cancelled and they’d agitated for more creative control. This is the first time you can get that on DVD. A handful of people online have complained that neither the Monkees episodes or bonus stuff were re-mastered, or that the transfer is poor, but frankly, I don’t really care, because of the breadth of material. I like that it’s a little grainy—some of this stuff is extremely rare and quite old, and it’s just excellent that somebody kept this stuff around in a vault in the first place. All told, it’s a great time capsule and one of the few things that parents and children could watch together and be equally entertained.